In the Philippines, the month of December is filled with joyous and festive celebrations. It is also the time of the year where the whole nation is commemorating the hard work and sacrifices, achievements, and positive contributions in the host and home countries, of the more than 10 million overseas Filipinos worldwide. For more than a century now, Filipino migration has laid a strong groundwork in shaping the Philippines’ image and standing in global affairs. It is on this note that the Inter-Agency Committee (IAC) on the celebration of the Month of Overseas Filipinos (MOF) and International Migrants Day will again lead the month-long celebration as a tribute to the Filipino migrants for their significant role as partner in the country’s collective efforts towards the goals of inclusive growth and national and local development. 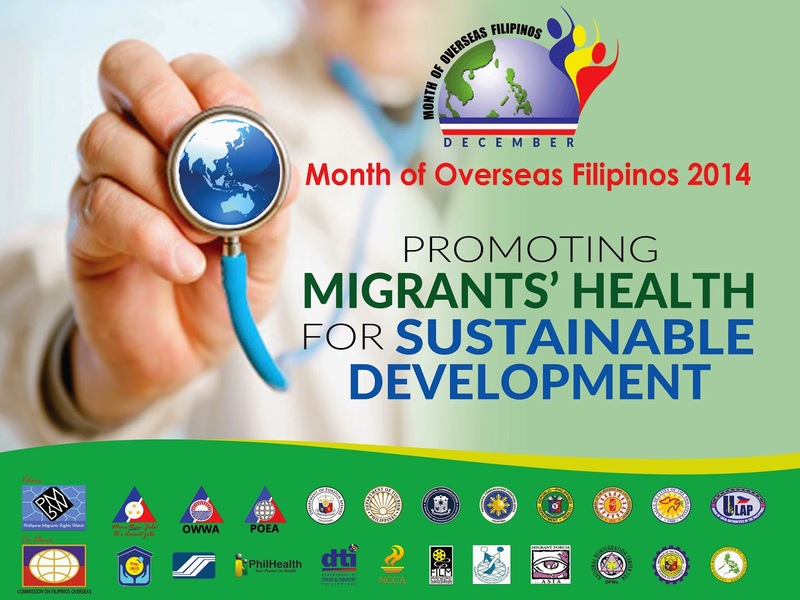 With the emerging issues and concerns related to and affecting migrants’ health such as mental health problems, HIV-AIDS and other infectious disease, and lack of access to basic health services, the theme for 2014 MOF is centered on the health and well-being of Filipinos overseas – “Promoting Migrants’ Health for Sustainable Development”. This is in recognition that the country’s greatest wealth are its human resources, and a testament to the reality that there’s still so much to be done for the welfare of overseas Filipinos. The IAC for the Celebration of the MOF and the International Migrants Day chaired by the Philippine Migrants Rights Watch and co-chaired by the Commission on Filipinos Overseas with other government and non-government agencies as members, has lined up various activities, programs and services benefiting Filipino migrants and their families, in line with this theme. Several international and local instruments have been passed to recognize migrants as agents of global development. In the Philippines, former President Corazon Aquino issued Proclamation No. 276 in June 1988, institutionalizing the commemoration of the Month of Overseas Filipinos every December. The United Nations General Assembly proclaimed December 18 each year as International Migrants Day on 4 December 2000. On the important date, all member-states, intergovernmental and non-governmental organizations, will commence the occasion and disseminate information regarding the fundamental rights and freedom of migrants. An Inter-Agency Committee for the Celebration of the Month of Overseas Filipinos and International Migrants Day was created through Administrative Order No. 202 issued in October 2007. The other members and partners of the IAC from government, private sector, and civil society include the Department of Foreign Affairs, Department of Labor and Employment, Department of Health, Department of the Interior and Local Government, Philippine Overseas Employment Administration, Overseas Workers Welfare Administration, Department of Trade and Industry, Department of Tourism, National Commission for Culture and the Arts, Film Development Council of the Philippines, Presidential Communications Development and Strategic Planning Office, Presidential Communications Operations Office, National Reintegration Center for OFWs, PhilHealth, Pag-IBIG Fund, Social Security System, Migrant Forum in Asia, Philippine Migrants Research Network, Union of Local Authorities of the Philippines, League of Cities of the Philippines, League of Provinces of the Philippines, League of Municipalities of the Philippines, and League of Municipalities of the Philippines. A forum tackling issues on Filipino migration with this year’s theme “Promoting Migrants’ Health for Sustainable Development”. The first international forum conducted by IAC, tackling issues on Filipino migration with this year’s theme “Promoting Migrants’ Health for Sustainable Development”. A Health Fair offering health promotion services (free nutrition counseling, HIV counseling, cholesterol and sugar check, BP, diamond peel, mass exercise, etc.) for migrants and their families. Awards given to private and public media works that have raised public awareness on issues on Filipino migration, advocated the cause of Filipinos overseas, or/and promoted a positive image of Filipinos overseas, and migration and development. A cultural presentation (song and dance) for overseas Filipinos and their families to increase the understanding and awareness of Philippine culture. Aims to showcase the best furniture and furnishings of local manufacturers, forge sustainable business relationships between SMEs and trade partners, and provide opportunities that may lead to increased employment. To showcase the talents and tourism attractions of the province. The activity presents an opportunity for CFO to strengthen its services for migrants, establish a network among the growing number of Filipino community organizations in Nordic countries and further encourage both financial and “social” remittances channeled towards the country’s development. The activity aims to echo united voice in protecting women’s human rights and ending VAW. The Forum presents an opportunity for CFO to reach out to the Filipinos in the Middle East and discuss various means of cooperation and engagement. It aims to strengthen CFO services for migrants and to help establish a network among the growing number of Filipino community organizations in the Middle East region. To create positive life-affirming event for, strengthen relationship among OFs and their families, as well create awareness and education on their roles in tourism promotion. The activity has no registration fee and freebies will be given to participants. There will be Larong Pinoy and Film Showing (tourism-related) after the Fun Run. Pre-Registration at DOT VI Office from November 3 - 28, 2014. The activity presents an opportunity for CFO and the Philippine Embassy in Rome to strengthen its services for migrants, establish a network among the growing number of Filipino community organizations in Italy and further encourage both financial and “social” remittances channeled towards the country’s development. Annual Christmas get together of OFWs from Eastern Visayas and their families, as well as OWWA scholars gift giving. An annual event of OWWA honoring and paying tribute to OFW families who remain solid and stable despite the odds and challenges they face and encounter. It aims to feature the best practices of OFW families in tackling the difficulties of migration and share the stories of success of Model OFW families that they may serve as an inspiration to others in overcoming the hardships of working abroad and boost the image of OFW families in the country. Promotion of Butterfly Festival and livelihood projects. Awards conferred by the President of the Philippines to honor and recognize overseas Filipinos and organizations which have selflessly supported relief, rehabilitation and development programs in the Philippines, contributed to the betterment of Filipino communities abroad or who have exceptionally excelled in their field of profession. A 30-minute show of moving Christmas displays with the theme "Paskong Pilipino" to give the park goers particularly balikbayans and their families and friends an enjoyable holiday celebration. To organize pilgrim activity in Puerto Galera and promote agro-trade fair. To promote the Puerto Princesa Bay as one of the major tourist attractions in Puerto Princesa City and organize activities such as fluvial parade and cultural presentations. The event will showcase various products and services and link attendees with professionals and exhibitors of the event. It will also provide the exhibitors with an opportunity to excel in their businesses and make a huge market base for them. The Awards annually honor individuals from various industries, who actively advance the welfare and human dignity of overseas Filipino workers. Back-to-back treats for families and park goers which will serve as the kick-off event for the Christmas season. A parade of cosplayers and mascots around the park and a program full of surprises for kids and kids-at-heart will take place afterwards. An annual public service project for the holiday season. Performances of different choirs will be presented. This series of nine masses held every December is an annual tradition of NPDC, in collaboration with the Archdiocese of Nuestra Señora de Guia (Ermita Church). It is a year-end outreach program of the Department of Labor and Employment to bring Christmas cheers to arriving/ vacationing OFWs. A tree planting activity with Pag-IBIG members. To provide a warm homecoming reception to OFWs coming home for the holiday season. To show our modern day heroes that they are important and appreciated for their significant contribution to the Philippine economy. A project initiated by the Department of Labor and Employment, Philippine Overseas Employment Administration, and the Overseas Workers Welfare Administration, together with the different national government agencies. An exciting performances of various artists and the spectacular fireworks display to welcome the New Year. To provide a warm welcome to visiting overseas Filipinos and returning OFWs. It is an annual program of celebrating the Christmas season with the OFWs and their family members to bring joy to them during the Holiday season which is reunion and bonding time. A regular public service project of NPDC which feature classical and soothing music to promote sense of nationhood and pride in being Filipino through culture and arts. Various performances featuring the best of seven arts: Music, Dance, Theater, Cinema, Literature, Architecture and Visual Arts. This is in celebration of the NPDC's 50th Founding Anniversary and in collaboration with the National Commission for Culture and the Arts and various stakeholders. A whole new treat to visitors at the Park which feature various forms of entertainment such as pop concerts, theater performances, cultural presentation, art workshops, games, and other surprises. Be serenaded by the finest performances of various Filipino and international musical talents. Various cultural presentations are held for free. Concert at the Park has won the Catholic Mass Media Hall of Fame Award for Best Cultural Program.